Does Niche Blitzkrieg System Work? An Insider Review. I was asked to review Michael Brown’s Niche Blitzkrieg System and so I did. Does it work? The answer is yes. More so, I am VERY impressed with the program overall because it goes into great detail on what you need to do. Newbies will not get lost when following this program and while I will be giving this program a green flag, there is 1 issue I have with this program and that’s it’s focus on backlinking. But I’ll explain that further down. The main purpose of this program is to help you build niche websites and utilize traffic generating techniques to make it successful (profitable). A niche website for those of you who don’t know is a website whose focus is on a specific audience and selling them something they are interested in. What happens within this program is that you first will find a niche market (say how to raise pugs) and then find keywords that people who are interested in this niche type into search engines. Then you will learn how to get visitors to your website via social bookmarking, writing up on article directories, backlinking (mostly the good kind) and other methods. Once you have this formula up and the site hopefully does well, you can then move onto the next niche and utilize the same steps again and again. There is the whole Niche Blitzkrieg system for you. First off, I’ve gotta say wow. It’s rare that I say that about a program I review since most of them are scams or just useless crap. With this program, it is not so. 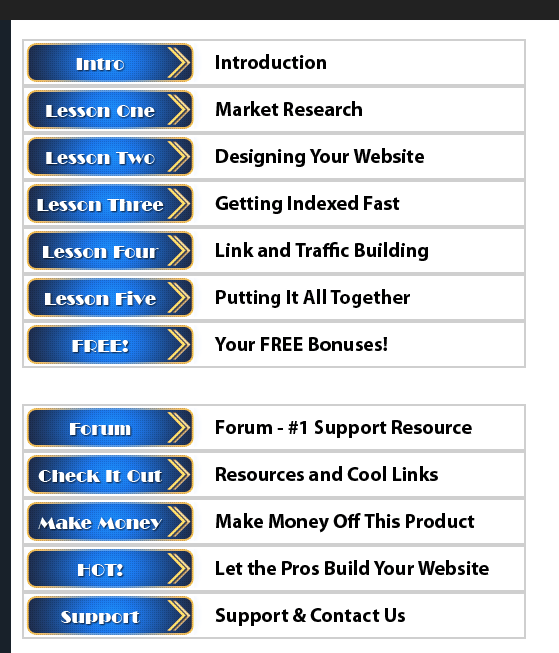 It is extremely detailed with videos, instructional images and text to help you along creating niche websites and making them work for you. First there is the introduction which shows you how to find niche markets. By the way, I created an easy to understand tutorial on niches in case you’re interested. You find keywords based on your niche and run them through the Google keyword tool which is free to use. While the tool does show estimates on how many people look for your keyword, you need to find out how much competition your keyword has. This is where you first utilize backlinking. What you’re taught is to find websites on the first page of a keyword you chose and find the number of backlinks they have. If it’s under a certain number, you can make a website, target that keyword and rank high. On a personal note: I’m not a fan of this method because I don’t like backlinking in general. I think this method is outdated and prefer to use this keyword tool because it will tell you the exact competition of your chosen keyword. If the keyword you type has a green light, you’re good to go. No need to get into these details which for all I know may not be as useful today as they were before. After finding your keyword, you will then make a website that has the same name as the keyword. If my keyword was “How to train pugs”, I would try to buy a domain name like howtotraingpugs.com or something like that. This method is called EMD (Exact match domain) which is another example of methods that are a bit outdated. EMD’s used to be a popular way to rank higher, but today they don’t carry as much weight. You can literally name your website anything you want and still rank high if you utilize proper guidelines. Anyway, you will create and start to build out your website. Newbies, do not be afraid. There is GREAT instruction on how to do all this within this lesson. You will learn how to have your website appear on search engines faster by doing things such as utilizing Google Webmaster tools and other places. Ok this is where I have some issues. There is A LOT of focus on using external websites (sites outside your own) to link back to your page. Such a method was good maybe 2+ years ago but today does not carry the same value. In some cases, this type of approach to SEO can negativley impact your website. I’d recommend this tutorial so you can see which methods of backlinking are good and bad. My personal advice is to centralize everything you do on YOUR website. Build out content. Focus on targeting low competition keywords and writing things about it. Most importantly help people. This is what gets ranked high on search engines nowadays. Content is king. Lesson 5: Basically a summary of the other 4 lessons. The rest of the stuff within the site is just an add on which is optional to use. One thing I like is the forum where you can talk to people and ask questions. The support within this site is good. There is also a link that takes you to a place which creates niche websites for you. This placed is called Niche Jet which I’ve actually done a review on before. Overall I didn’t rate it favorably because there’s better alternatives. Either way, I like this program alot. Visit the official site here. This program works if you use it’s training. Lots of high quality training. They are offering a $4.95, 7 day trial where you get full access. Join here. Some training is a bit outdated (EMDs, backlinking and how to find competition for keywords). I didn’t see any training on PPC or email marketing. Michael Brown, you did an excellent job with this program. I like what it has to offer and there is GREAT detail on what needs to be done. This program is absolutely excellent for newbies. My only complaint is again the whole focus on backlinking. Nowadays it’s all about high quality content creation. I strongly recommend focusing more so on that than backlinking. I actually contacted Michael Brown on this and hopefully he will add this in. If he does, I’d be more than happy to give it an extra star or two. This program definitely deserves it. 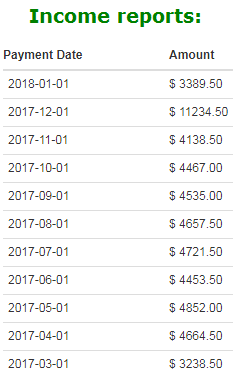 Can you make a lot of money with this program? Potentially. Niche websites are certainly the way to go nowadays but as good as the training within Niche Blitzkrieg is, I still this is a better alternative overall because it’s more up to date and just as detailed if not more so. Either way if you’re considering Niche Blitzkrieg, know it is a legitimate program. If you have tried it before or have any questions on it, feel free to let me know! Update: The creator has moved to a new program. The program is known as Niche60 and it is also good, I explain it a little bit more here. On that page, you’ll also see 4 more affiliate program recommendations similar to Niche60 that work too. hope it works for me..
It’s a great program Diane, so is the support. Both programs are completely legitimate in my book Zubair. I rarely give any program a green light. Both of these places offer practical methods of success, though I believe WA is better because it is more up to date.